Prior to the start of the season, life was a cabaret for the Indianapolis Colts. 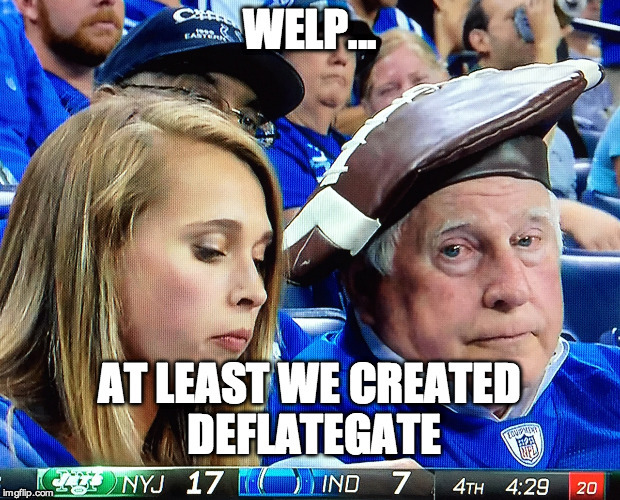 As of August 31, the Colts lit the fuse on Deflategate, indirectly got Tom Brady suspended for the first four games of the 2015 season, and were considered a favorite to not only reach Super Bowl 50 but to win it thanks to offseason moves such as signing Frank Gore and Andre Johnson. As of September 22, the Indianapolis Colts are 0-2 after a home loss on Monday Night Football (just like last year). However, they don’t have the security blanket of Brady’s suspension helping them out anymore in the AFC’s landscape. This 0-2 start feels different. A listless 20-7 loss to the Jets exposed the Colts for who they seem to be this season: a weak, overrated squad that has one great player and not much else to brag about. Due to Indy’s slow start, the Jacksonville Jaguars are in first place for the first time since the 2010 season. Jaguars in first place for the first time since Week 14 of the 2010 season. First time in 73 weeks. What a start to the season.